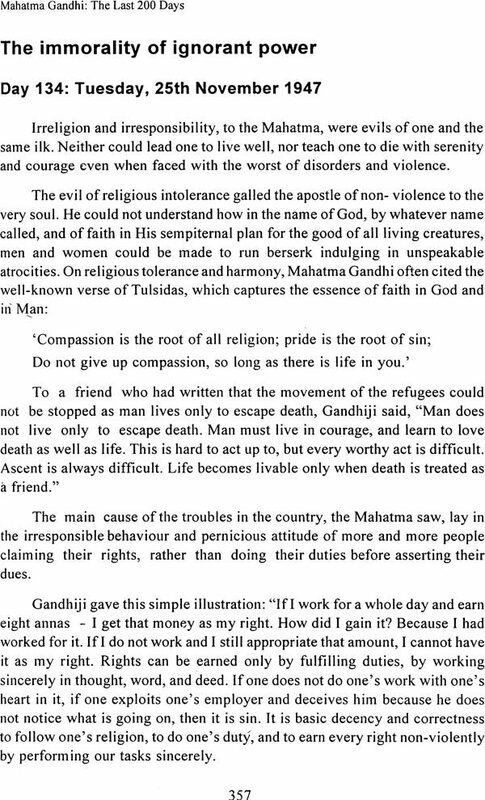 Mahatma Gandhi's life, attitude and political action were informed by the highest moral principles and compassion. Uniquely among public men, he sought to analyse and explain events and his own reaction in terms of these principles through his talks, statements, writings and interviews. The moral force that he brought to bear on the political discourse was compelling and inspired large sections to take up the cause of freedom. When freedom finally did come, it was no doubt a cause for celebration. Tragically, though, it was also a traumatic time that witnessed large scale killings and transfers of population across the new boundaries drawn up by Partition. At no time was moral force more badly needed and at no time was it more sorely tested than in these difficult times. 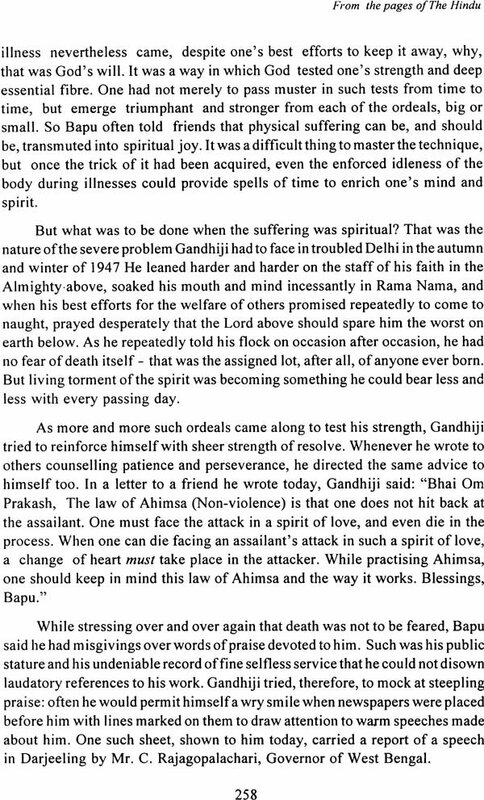 Mahatma Gandhi stood unflinching as a moral force and sought to douse the raging passions. The events surrounding his life and action in these times provide an object lesson in living morality. The last 200 days of his life in particular, provide a fascinating lesson in applying moral principles to situations which seemed totally out of control, when prejudice was all encompassing and even well-meaning advice of restraint to a friend could be mistaken for hostility. For rendering a day-to-day account of the last 200 days ending with January 30, 1948, no person was better suited than Mr. V Ramamurthy, retired senior IAS officer, a writer of great scholarship and sensitivity whose activities extend from cricket commentary to teaching courses in management science and whose writings touch upon a vast range including Carnatic music and Tamil literature. His daily contributions drawn primarily from the archives of The Hindu and supplemented from other sources were published over a period of 200 days ending with January 30, 1998. It was with some hesitation and some measure of doubt whether present day readers would be interested in the details of happenings in an earlier era that this series was started. Within weeks, however, the reader response was so overwhelming that all such doubts disappeared. The accounts presented in a historical context with all its drama and richness of detail seemed to fascinate the young who had only a vague idea of the events of the time, and seemed to touch a nostalgic chord in the old who had lived through those times. Soon after the series ended, there were suggestions that the accounts be compiled in a book as the material was of lasting interest. Indeed, some readers had painstakingly made their own compilations of the newspaper clippings. It is a matter of great satisfaction for us that the book has finally come into being and we hope it would be of widespread interest. In these communally charged times, the message of peace and the uncompromising application of moral principles to political action would seem to be of particular relevance. It will be in order for me to write a few words giving the background of how I came to write the articles collected in this book. For reasons that go back to childhood, I developed deep fascination for the life of Mahatma Gandhi. I was born in Calcutta. In January 1948, I was twelve years old. My father R. Viswanathan and my mother Bhageerathi had moved from Cacutta to Karachi in 1936, in Karachi we lived in reasonable comfort. My sister, Raji, was born there in 1938, and that city was our home for as long as we could remember. My parents has a fair circle of friends. No ripple seemed to disturb the course of our life. My father believed that, like Muslims in India, Hindus in Pakistan too could live in peace despite Partition. Let me go back little. My father and mother had given me an Ansco 'Shur-shot Junior' box camera, and a framed picture of Mahatma Gandhi with stand for keeping on a table. The independence of India was in the offing in 1947, but there was no sign of anything coming to upset the even tenor of our life. We used to visit friends, or have them come home. We went to school, shopping, to movies, and to the Mahatma Gandhi Garden, where fresh rose-flavoured Gulabi grapes could be bought cut freshly from the vine. Independence Day came and went. We celebrated the occasion. It was a holiday. At 5 p.m. every day we used to listen to a programme in Tamizh, broadcast by the External Services of All India Radio on short wave from Delhi. The programme began invariably with a piece of fine nagaswaram music. Later I learned that it was 'Vatapi Ganapathim Bhajeham' in raga Hamsadvani, in a 3-minute 78 r.p.m. record of Thiruvengadu Subramania Pillai. As the months went, uneasiness grew in the air. When I went out on my new Norman bicycle displaying a tricolour flag, I was thrown down by some people and the flag roughly seized and rudely torn. The calm of our lives was about to be disturbed profoundly. Though Partition had taken place, we did not register the fact that suddenly we lived no more in India, but in a new country, Pakistan.
. Refugees started to flow into Karachi. Uprooted Muslim evacuees coming in large numbers from East Punjab were more or less at liberty to walk into any Hindu house and take it over. The police would not interfere. We lived in the extension part of the city close to the. cantonment, and yet it was suddenly no longer safe to venture into the streets. My sister and I used to ride on the bicycle to fetch groceries, butter etc. These little trips became hazardous and we were told we should not go out any more. I went to St. Patrick's School and my sister to the St. Joseph's Convent School beyond Sadar. Going to school also stopped. My father's Muslim driver, Yaseen, and servants, Mahmood and Basharat, the latter a strong strapping Pathan, were coming as usual. We didn't think of them as Muslims and of ourselves as Hindus. They helped in the house and often joined in when we fed the one-eyed parrot, Mitu, in his cage, and had fun with the cat Toppy, and a black tom-kitten, Whoopee. My father went daily to Malir near Drigh Road aerodrome, where he was in charge of an Army Contract business which was doing well. Father had earned praise from no less a person than the Commander- in-Chief of India, Field Marshal Sir Claude Auchinleck when he visited the station. Father used also to go to Mauripur airport. He was driven to and from work by driver Yaseen, and often returned home late at night. Mother used to be on tenter-hooks till he came back. I remember that the gates used to be locked and we would be in the puja room praying. There were occasions when curfew came into force at 7 p.m. and if my father hadn't returned by then, we knew he could not do so till the next morning - and we were all alone in the house. One night he came back past eight p.m. and said that Yaseen had decided to make a dash for it all the way from Malir, since it might be unsafe to stay the night far away from the city. It was an instinctive, wise action by Yaseen. The next day we learnt there had been violence on the road, blood had been shed, and lives taken. Gradually it dawned upon us that my father's hopes of continuing to live in Karachi were far-fetched., My father's friend D'Sa, a lawyer, advised us to prepare to leave Karachi and look for a new life in India. The only unchanged thing was our listening to the 5 p.m. A I R broadcast. It is strange to think that Raji and I felt that things would still settle down. We had a naive belief, probably reared on what our parents had told us, of the strength Mahatma Gandhi commanded - to work miracles and bring peace back wherever trouble brewed and grew. We prayed as much to God as to Mahatma Gandhi for Karachi to become again the beautiful and fine place we had known it to be. We could not think of leaving it at all. The blow fell on the Friday the 30th of January, 1948. We tuned in to Delhi as usual on our small General Electric table radio. On 19 metres we picked up All India Radio's External Broadcast. At around 5.15 p.m. the programme was interrupted, and a voice from Delhi station asked us to stand by for an important announcement. 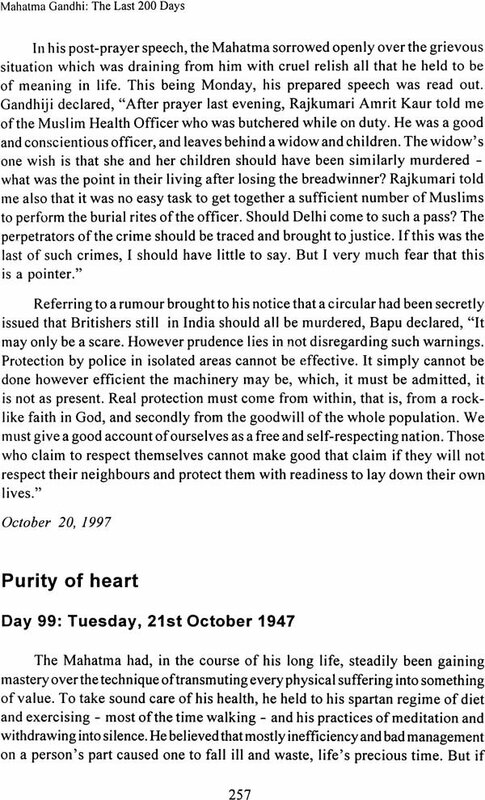 Soon the news came that Mahatma Gandhi had been shot while going for his prayer meeting in Birla House. Strains of sombre music came over the air. Within a few minutes, the news of the Mahatma's death was announced in a heavy voice. The world had come crashing about our ears. All of us wept through the night. We didn't eat or sleep. In "The Daily Gazette" and "The Sind Observer" the next morning, we read the headlines and saw the pictures. We listened to details of Gandhiji's funeral procession on radio. Every home felt bereaved. In a few days, we went to the sea-shore at Clifton, where Indian High Commissioner Mr. Sri Prakasa led the ceremony of immersing the Mahatma's ashes into the ceaselessly moving waters of the Arabian Sea. We started a new life from scratch in Madurai, the temple city. 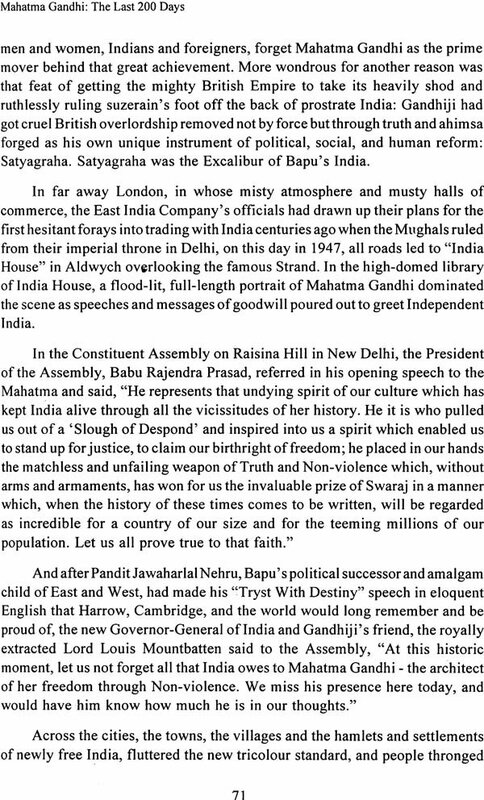 In October 1948, I bought from Sakthi Karyalayam, a copy of Mahatma Gandhi's Autobiography, "My Experiments with Truth". Over many years I gained understanding from it as I grew in age. Meanwhile, I collected many other books and pictures about the Mahatma, and his quotations, whenever I could. The photographs of Gandhiji touring riot-torn Noakhali, of his walking to his prayer meetings, and of his face ever so serene in death haunted me deeply. I felt that in the closing phases of the Mahatma's great life a Greek tragedy had unfolded. Early in July 1997, J had a meeting with Sri N. Ravi, Editor of The Hindu, in his office. I asked him if he would like a serial to be published; on life as it unfolded day by day for Gandhi'ji in his last 200 days, leading up to the 30th of January 1948. By coincidence, the 30th of January 1998 was to fall on a Friday, as it had done fifty years earlier. Sri Ravi welcomed the idea and asked for a drawing to be done by Keshav, the paper's' cartoonist and illustrator, and arranged for the serial to be started with that drawing. 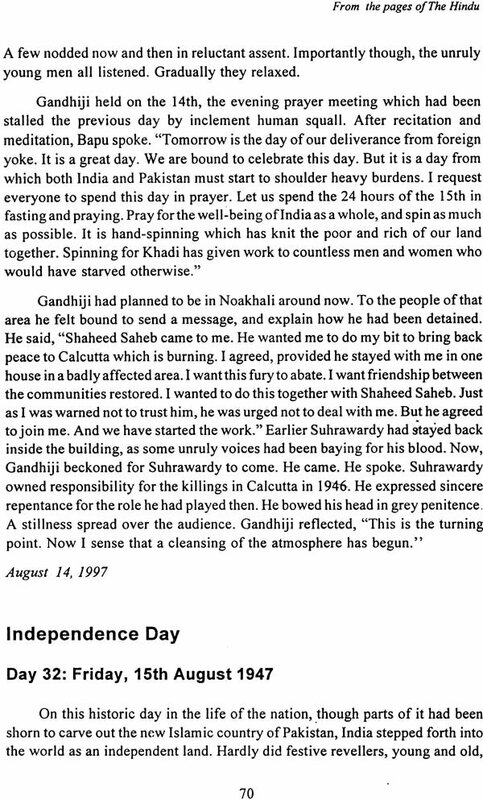 The articles were published daily from the 15th of July 1997, under the title "Mahatma Gandhi - The Last 200 Days". 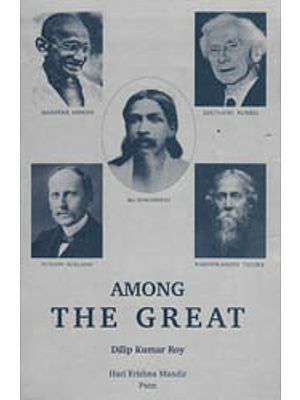 Information for the articles was collected from the vast archives of The Hindu and The Collected Works of Mahatma Gandhi (Publications Division, Government of I ndia). The serial was well-received, and many readers wanted to know when the articles would be published as a book. Originally, the plan was for the unedited longer articles sent by me to be published in book form with useful supplementary information. But many preferred to see the pieces as they had appeared daily in The Hindu. And that. is how the articles appear now in this book. A set of photographs has been added, and the full texts with translation given of 'Vaishnava Janato' and 'Raghupathi Raghava Rajaram' (Ram Dhun). Gandhiji's message was his life itself. In the days that preceded and followed the lS'h of August 1947, he went through episodes which tormented him to the very core. But they did not overwhelm his hope or erode his faith. To the end he thought, spoke, wrote, and worked for what he felt were the vital, eternal values of human life. Today, India, and the world, can yet benefit from many of his teachings. 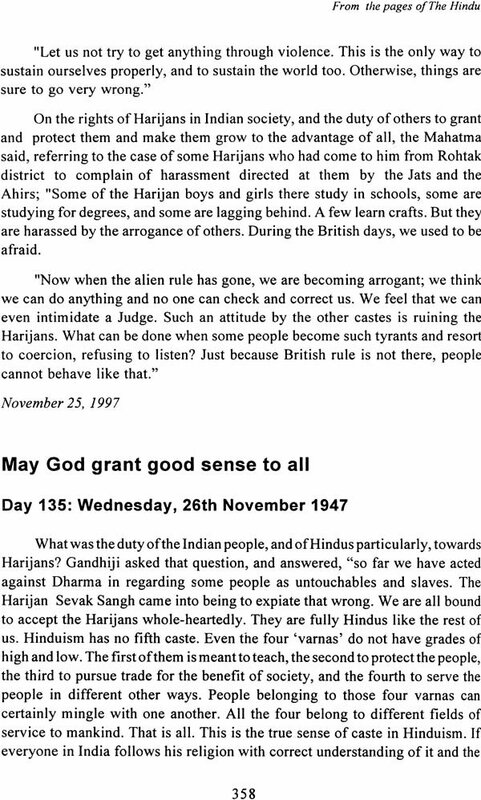 I do believe that the account in this book - based on material of the day with supporting background information - of the last 200 days of Gandhiji' s extraordinary life may rekindle interest in his teachings and set off further enquiry, research, and new writing relevant not only to the times that we live in now, but for all time. I am deeply grateful to The Hindu, and to Editor Sri N. Ravi, in particular, for publishing these articles as a serial, and for now bringing them out in book form. I humbly dedicate this book to the souls of my departed parents and my son Ranjit Kumar. My wife Kamala especially, and innumerable friends, have helped me in writing the pieces in the first place in 1997-1998, and now in preparing them to be brought out in this edition. I thank every one of them most sincerely. Mohandas Karamchand Gandhi, a child of mid-19th century Porbander in India. Student of law in London qualifying as a barrister of the Inner Temple fighter for minority rights in south Africa, canny politician, social reformer, insatiable soul ever in quest of the truth, speaker, writer and soldier extraordinaire in the fight for India's freedom from foreign rule, was in his 78th year in most of 1947. He would enter his 79th year on October 2. Mahatma Gandhi had believed that he would live to be 125. In a life packed with crowded events and noted for its ceaseless toil, struggle, and self-denial, he took reasonably good care of his health with a combination of diet, physical exercise meditation religious devotion and nature cure methods. His zest for life and energy were remarkable for a man of his age, but not surprising in one given over so strongly to rigorous self-discipline. When India was on the verge of attaining freedom, but at the cost of being separated into India and Pakistan, some of Gandhiji irrepressible zest or living seemed to come down. The flare up of fratricidal communal violence in parts of India, where the prospect of Partition unleashed bestial violence in the name of religion, had him ceaselessly toiling to contain the spreading contagion, often at peril to his safety about which he was completely unconcerned. But even as he thought, prayed, wrote, travelled and spoke, appealing everywhere to the conscience of his fellow citizens, his thoughts were taking on a note almost of resignation. He expressed, at times, as horror of living long if it was only to see more and more of the Human tragedies that were unfolding all around. The story of the last 200 days of the life of this great apostle is packed with a spirit of drama. Those days marked what few at the time realised was to be the rendering of the swan song of a great life of our times. We commence this diary events starting on the 15th of july. One month remained for Indian to attain the freedom for which he had fought for so long. Two hundred days remained to be played out in the life of the man who had been christened Mohandas Karamchand long years ago, in 1869, in the Kathiawad region of British India. It was a nation ruled by the most powerful Empress of her time, the grand Queen Victoria. That rule by Britain was drawing to its close in July 1947.